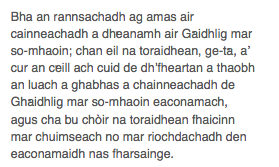 Tha Gilleasbuig a' moladh dhuibh na h-aithisg iongantach seo, Gàidhlig mar so-mhaoin Eaconomach is Shòisealta, a thàinig an rathad an t-seachdain-sa. Cha do sguir e ghaireachdainn fhathast. Gilleasbuig was proud to see the Royal National Mòd back in Inverness, for it is an imaginative, inspiring and innovative festival which has done so much to make the Gaelic language what it is today. Debate and discussions flourish, and bàrdachd and literature fully capture the pulse of the event as the Mòd organisers' own press releases, reported unchallenged in all newspapers, helpfully explain. How satisfying it was, therefore, to study the fine bilingual Mòd supplement supplied on the 10th October within the pages of the West Highland Free Press to all readers of that fine newspaper - a.k.a. Pàipear Beag an Eilein Sgitheanaich, the newspaper of "AN TIR, AN CANAN, 'SNA DAOINE [sic]".